Now, it may not sound like a big deal to acknowledge there are anti-monarchists, even some violent ones, in the country. But considering anything related to the Queen must be handled by a government funded agency with the utmost diplomacy, it was a courageous step indeed for the museum to give some wall space to the Queen’s foes. When it comes to anything royal, die-hard monarchist Stephen Harper and his heritage minister James Moore are close by, watching intently, deciding whether to tighten or loosen their purse strings while funding museums. The exhibition, A Queen and Her Country, is generally a wonderfully nostalgic trip through the 60 years Elizabeth has served as Canada’s monarch. Yes, she is the Queen of Canada. Canada is, for better or for worse, a constitutional monarchy. There are the inevitable souvenir mugs, plates, tea sets, and figurines. There are the iconic photographs, including one of Elizabeth square dancing at Rideau Hall in 1951 when she was a princess and not yet a Queen. There is a print of the famous portrait by Welsh artist Margaret Lindsay Williams, the first official portrait after Elizabeth became Queen, that hung on the wall of every school and post office in this country for decades. That picture is so familiar to people of a certain age, it is like looking at a relative’s portrait. 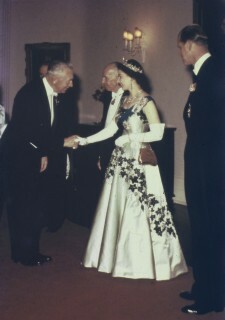 The Crown jewel, so to speak, is the Queen’s famous “Maple Leaf of Canada dress” designed by British couturier Norman Hartwell for a 1957 state dinner at Rideau Hall. It’s a white ballgown decorated with sequins and green velvet maple leaves. A real stunner. A Queen and Her Country, at the Canadian Museum of Civilization, opens to the public on July 1 and runs until Jan. 6, 2013. For information, visit www.civilization.ca.